How to convert documents of HTML to PSD? 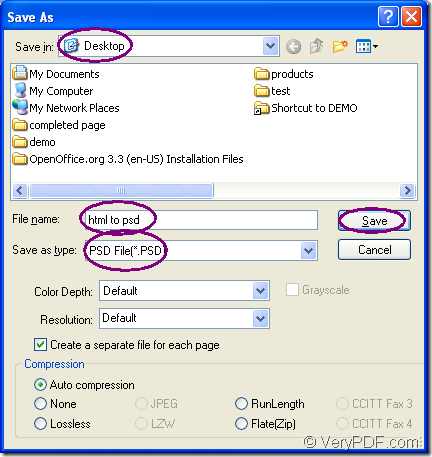 PSD is a kind of image format and if you want to convert the printable document of html to psd format file, you can use VeryPDF Document Converter as your tool application. In this article, you will see how to fulfill this conversion with the help of the virtual printer application of Document Converter—docPrint. docPrint can play two roles—Virtual printer and document converter. As a virtual printer, docPrint can be used to scale page to various sizes or combine several pages in one sheet to save paper and ink. As a document converter, docPrint is able to convert any printable documents to image formats within three steps. You just need to print the document to be converted to docPrint for launching it. But at first, you should download Document Converter at http://www.verypdf.com/artprint/docprint_pro_setup.exe and install it on your computer. Then you can see docPrint in the printer list by opening the “Start” menu and clicking “Printers and Faxes”. Two other applications—GUI application and command line application all stay in the installation directory. The following contents are all about converting document of html to psd and only three steps are required. You will do get some useful information if you can read this article carefully. If docPrint is the default printer, you should right click the HTML document and click “Print” option to run docPrint instantly, which is the most convenient way. On the contrary, you should open the HTML document and click “File”—“Print” to open the “Print” dialog box in which you can choose “docPrint” as the current printer in “Printer” combo box. Then please click “OK” button. If you don’t like this way to open the “Print” dialog box, you can also use the hot key “Ctrl”+ “P”. You can use the hot key “Ctrl”+ “S” to open the “Save As” dialog box. To quickly open “Save As” dialog box, you can also click the “Save File” button in the toolbar. The regular way is clicking “File”—“Save as”. Please choose the location for the target file in “Save in” combo box. Input a suitable name for the output file in “File name” edit box. Please find the right output format in “Save as type” combo box. If you have finished all the operations above, you will get the target file successfully after the conversion from html to psd. If you want to read more articles about docPrint, welcome to visit the blog VeryPDF Knowledge Base.